Have You Received an Email About ReferralKey Lately? I recently spammed all of my LinkedIn contacts with an endorsement for the website ReferralKey.com. A LinkedIn friend of mine sent me the same invitation in a rare moment where I had fantasies of bringing in some business for my SEO shop; boy would my partner be astonished when I suddenly started setting up biz-dev calls like I was Alec Baldwin in Glengarry Glen Ross. But I did say I spammed my contacts, so this isn’t going to be a happy story. I was in the middle of fully exploring the site myself when the response emails started pouring in, what had I sent them they asked. I felt I owed it to these contacts (many of whom are obviously close friends and business partners) a thorough review of the site before I wasted all of their collective time or maybe even before they passed up on an exciting new social business website. I initially tried to find value in ReferralKey by using the tools of the site itself. There is an introduction video which seemed like a good place to start – but this simply gave me a handful of ways to invite more people. But I wanted referrals. I wanted leads. After trying out each tab and button on the site I quickly discovered the meat and potatoes of the site – inviting other people to the site. If you are still using Juno for your email they probably have an importer built just for you. And they don’t always give you the chance to tell your imported contacts about the site in your own way. Import your LinkedIn contacts and they are going to receive the same cookie-cutter template that every other person on the site was dupped with. No, I in fact do not know any of those people. And what exactly makes them Pros? What are they Pros in? Am I really supposed to just start adding seemingly random people with no qualifications as to why they are showing on my homepage? This defaults to “Most Helpful Posts” of which I found none of them helpful. I mean, they were helpful, just not to me. Because as I scrolled through an endless list of gardening tips, property management, and other random tidbits none of them meant much to someone in my industry. First, I know, it is a Facebook chat box with strangers who you are supposed to strike up business conversations with. Putting aside the fact that no one would actually do that thinking this was a valuable way to spend their time – I started chatting with people. It was hard at first, as the list is once again filled with almost completely unrelated contacts, and strangely in alphabetical order by industry. No one responded, in fact one person even blocked me. Ouch! And then I got a chat invite, someone was actually engaging me in conversation, awesome! Of course they were an outsourcing shop in the Philippines and a Google search on their name revealed a few listings on scam websites (at least their rates were low). Alright, the site doesn’t seem to have the best ideas behind it. But it sure looks sharp and it seems like a ton of people lately are receiving those spammy invites, so maybe it just needs to reach critical mass? I thought long and hard about it and I don’t think so. The only meaningful connections I can imagine making on the site are to people I already know. Maybe this website could be a great management system for referral leads, but that is clearly not what is being attempted. And so if I have a referral for someone, I’ll probably just shoot them an email or message them on an already existing and popular social network. The only other idea that the site is hoping to stand on is that a bunch of random people are going to connect with each other on a poorly thought-out website with very limited information about the other party. I think LinkedIn is keeping all of the business stalkers out there (I should know, I have a good friend in recruiting) quite content. So sorry everyone for spamming your inbox. Now you can knowledgeably delete this website from your life. 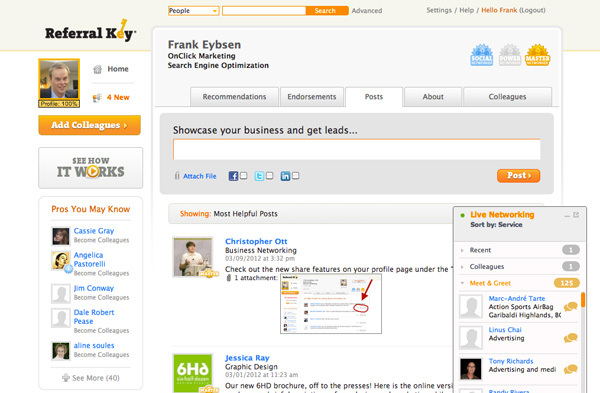 Frank Eybsen is co-owner of OnClick Marketing. When not working he plays music. There’s a lesson we could all benefit from learning. Even if you haven’t spammed friends’ email accounts, everyone has been guilty at some point or other of showing a little to much enthusiasm for the latest thing. I just got one such email and right after checking with the sign up page, headed straight to the Google and picked your story to know a bit about referralkey. Thank you Frank, you saved the day! I was suspicious when my friend’s invitation to referralkey offered to send some business my way. Um, I’m on the central IT staff at a state university. So I immediately smelled a rat, and like others here, Googled my way to you. Thanks for the post.